The SL lineage had earned its cultural wages by being a primary definition of elegant droptop motoring since the 1954 190SL and the 1957 300SL roadster. The 1963 230SL, otherwise known by the hallowed moniker “Pagoda Roof,” followed that devastating first act. Come 2008, the last year of the R230 series, the fundamental proportions of the SL63 AMG were almost fine enough to justify redesigning the Fibonacci spiral. The R231 Mercedes-Benz SL that arrived in 2013 had just one conspicuous fault: the way it looked. Because of this, it meant there was everything wrong with it. In our First Drive of the 2013 Mercedes-Benz SL, we opened the discussion of its overhauled face with the gentle phrase “a dramatic rework,” then laid straight into bare-knuckle boxing with “we can’t avoid the elephant in the garage: styling.” Not everyone agreed on what kind of beast had taken up residence in the carport, but even Mercedes knew it had scored ein Eigentor – an own-goal.For 2017 the fix is in, mainly a revised front end that repairs almost all the damage. The grille opening flips 180 degrees to form a conventional trapezoid shape. By having corners that converge upward, the inner edges of the headlights present natural, parallel edges with the central opening. Those alterations, plus the smooth sheetmetal, eliminate the crisscrossing angles and geometric leftovers from the previous-generation SL. The dual LED headlights are also wider than the retiring single-lamp units, the stretch routine making for a more balanced face. The width is accentuated with new lines in the lower bumper, as well as a wide, narrow “A-wing” spread between larger, square-ish intakes. While still not supremely graceful when viewed dead-on, it is a huge and welcome improvement. Alterations ’round back are limited to the bumper, which gets air extractors along the edges and more rakish trapezoidal tailpipe finishers flanking a diffuser-like insert. The cosmetic efforts increase the convertible’s length from 181.6 inches to 182.3, and drop its height from 51.8 inches to 51.2. Interior revisions include a new steering wheel design with a round center section, two more ambient lighting options, plus an all-black color scheme for the instrument cluster and dash-mounted analog clock. Saddle brown leather hides join the options list; two USB ports join the connection options in the center console storage area.With the prettifying comes additional performance, and continuing education in why the SL-Class model range represents four treads on the stairway to roadster heaven. The pivotal achievement is that the SL450 is an incredibly satisfying starting point. 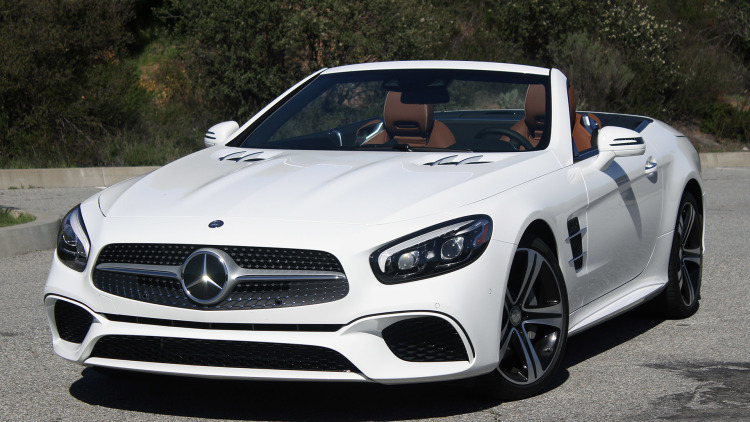 Known as the SL400 presently, the SL450 carries over the 3.0-liter twin-turbo V6, but brings with it 32 more horsepower and 15 more pound-feet of torque, totaling 362 horses and 369 lb-ft. The new numbers shrink the 0-60 sprint from 5.1 seconds to 4.9 seconds. Take one step up to the SL550 and you’ll find the 4.7-liter twin-turbo V8, with its output unchanged at 449 hp and 516 lb-ft, but its 0-60 dash decreased by two tenths of a second to 4.3 – matching a Porsche 911 S Cabriolet – thanks to the new nine-speed automatic transmission. Standard tire sizes on both models increase from 18 inches to 19, but the wheel widths and tire footprints don’t change – rather, the sidewalls shrink to accommodate. AMG-tuned SL63 and SL65 models carry over, and we’ll have a full report on those darlings in the not-too-distant future. Mercedes conferred sporty character on the V6 and christened the V8 the cruiser, but these are ornamental distinctions – any configuration in the SL range is a fine tool for carving up canyons. It’s been this way since 2009, when Mercedes decided that doctors and their mistresses should get as much joy from twisty bendy roads as they got from their billets-doux. The 450 is fitted with a completely different exhaust than the 550, so it’s gruffer in every one of the five driving modes before you start pushing hard. The substantive differences, though, are the lighter curb weight of the V6 and having to work it marginally harder to draw out the performance.Sport mode limits top gear to seventh, Sport + caps things at sixth gear, keeping revs closer to the 5,500 rpm mark where peak horsepower begins. Stomping through the esses in Orange County, California and the Cleveland National Forest in Sport +, there’s lengthy brake pedal travel when setting up for turns, but braking response is linear. The steering loads up on resistance, not feedback, as you lay on the lock, but placing the wheels is a cinch because the Direct Steer rack is snappy and the SL doesn’t squirm or fidget through lateral forces unless you command it to. There’s plenty of rubber on the ground and the Active Body Controlsuspension uses electronically controlled hydraulic rams instead of anti-roll bars to keep the upper quarters level. At corner exit, the combined might of 362 hp and 369 lb-ft is ample enough to keep the SL450 cooking out of tight turns. Mercedes didn’t divulge curb weights for the US-spec models, but the current, 2016 model year SL400 and SL550 variants are 165 pounds apart. An engineer told us that the V6 engine alone is 121 pounds lighter than the V8 on the 2017 models, so the SL450 gets an entirely different suspension and you can feel those missing pounds in the sprightlier movements of the convertible’s nose. What you get in the SL550, then, is more acceleration and meatier dynamic sensations. SL models can be optionally fitted with the Curve Tilting function making its way through the Mercedes lineup. If chosen, it replaces the Eco mode in the drive settings, and employs the suspension’s hydraulic rams to tilt the vehicle in the direction of a curve up to 2.65 degrees beyond horizontal to counter lateral acceleration. Contrary to our expectations, Mercedes considers this a comfort feature, which is why it has its own setting and doesn’t operate in either of the Sport modes. Speaking of which, our only gripe about the different drive modes is having a button, instead of a knob, to choose them. Button operation means you might need to cycle through every option to get the one you want. This was fine when there were only three choices – Sport, Economy, and Comfort. Adding two more requires paying attention.